Dio was an American heavy metal band led by vocalist legend Ronnie James Dio, who formed it in 1982 after leaving Black Sabbath. In an interview, available on the special edition re-release of Holy Diver, Dio states that he never intended to begin a solo career. His intention was to form a new band with fellow former Black Sabbath member, drummer Vinny Appice. Naming the band Dio made sense from a commercial standpoint, as the name was already well-known at that time. Dio in Italian means "God". The band released ten studio albums and had numerous line-up changes over the years with Ronnie James Dio being the only constant member. Guitarists included Jake E. Lee, Doug Aldrich, Vivian Campbell, Tracy G, Craig Goldy, and Rowan Robertson. ?It was a good time to be in that band. It was perfect for us. Everything just fell into place. The ethic in rehearsal was amazing. The effort in the recording was just as good. Everybody wanted it to be great. We really believed in what we were doing and couldn't wait to get that product out and have people hear it." Now a quintet with Claude Schnell on keyboards, the band released their second studio album, The Last in Line, on July 2, 1984. It was followed by their third album, Sacred Heart, which was released on August 15, 1985. In 1985 Ronnie James Dio also wrote the song "Stars" for the Hear 'n Aid project, with Vivian Campbell contributing on guitar. Campbell became unhappy with the direction of the band and in 1987 was invited to join Whitesnake. Several songs were recorded live during the Sacred Heart tour for the 1986 Intermission EP with Campbell still on guitar, however the EP also contained the studio track "Time To Burn". which served to introduce fans to Craig Goldy as the new guitarist. On July 21, 1987 their fourth album Dream Evil was released. After Dream Evil, Goldy, wanting to pursue solo projects, left the band. In June 1989 18 year-old Rowan Robertson was announced as Goldy's successor but further changes were to follow, with Schnell, Bain, and Appice leaving the band. Schnell, Bain, and Appice were replaced, respectively, with Teddy Cook, Jens Johansson, and former AC/DC drummer Simon Wright. The new band released the album Lock up the Wolves in the spring of 1990. During the tour, Ronnie James Dio had a chance meeting with former Black Sabbath bandmate Geezer Butler which led to that band's short-lived reunion, producing one album, Dehumanizer. After this Ronnie James Dio reassembled Dio once again, retaining only Appice on the drums. By late 1994 guitarist Tracy G, keyboardist Scott Warren of Warrant and bassist Jeff Pilson had all joined. During this era, the band abandoned fantasy themed songs and focused on modern issues. As a result some fans regard the albums made during this period?1994's Strange Highways, 1996's Angry Machines and the live album Inferno - Last in Live--as the worst in Dio's catalogue, while others view them positively as a step away from the outdated sound of the 1980s. With disappointing record sales for Angry Machines management wanted the band to go back to their earlier style prompting the departure of Tracy G to be replaced by the returning Craig Goldy. Craig Goldy's return facilitated the release of Dio's eighth studio album in 2000, Magica, which was regarded by many as the band's "comeback album" and reached #13 on the Billboard independent charts. It featured the return not only of Goldy but of Simon Wright and Jimmy Bain, although on the European tour Chuck Garric played bass. A concept album, Magica features a return to the band's older, more successful sound, while increased use of keyboards gives it a modern feel. During the following tour, however, tensions rose between Goldy on the one hand and Bain and Ronnie James Dio on the other, as Goldy was dealing with the obligations of a family. Goldy left the band in January 2002 and was replaced with Doug Aldrich, whom Bain had met while recording a tribute album for Metallica. Because of his late arrival, Aldrich did not contribute much to Dio's ninth work, Killing the Dragon, which was written primarily by Ronnie James Dio and Bain. Killing The Dragon was released in 2002 through Spitfire Records and was well received in the metal community, making the Billboard top 200. Aldrich would stay in the band until April of the following year, when he, like Campbell before him, joined Whitesnake, prompting Goldy's return. Soon afterwards, Bain left the band. Dio released their tenth studio album, Master of the Moon on August 30, 2004 in Europe through SPV Records and on September 7, 2004 in the United States through Sanctuary Records. The album features multi-instrumentalist Jeff Pilson (formerly of Dokken) on bass duties; however, because of prior obligations with Foreigner, he was only available for the recording sessions, and so was replaced by Rudy Sarzo. 2005 saw the release of the Dio live album Evil or Divine - Live In New York City, which featured the same show that was released on DVD in 2003. Dio has claimed he did not have much input on this release, as he had already left the label that released it. Dio toured South America, Japan, Europe, and Russia in 2005. Their autumn tour was titled "An Evening With Dio" and featured a regular set, and then a second set of the band playing his 1983 album Holy Diver in its entirety. The band was purportedly going to film a date from this show in Russia for future DVD release; however, the show on the DVD was actually filmed in London, England. The audio of this performance, a double CD named "Holy Diver Live" was released in April 2006. ?It sounds great. It's a real cross-section of everything we've done, from Heaven and Hell through Mob Rules and Dehumanizer. I think there's a lot of Dehumanizer in it, but a lot of other things, too, a real good blend of what this band has represented..."
Ronnie James Dio's involvement with Heaven and Hell delayed the recording of what was to be the follow-up to Master of the Moon, Magica II. The three year hiatus was briefly interrupted for a 10 concert European mini-tour in May/June 2008, and was scheduled to be interrupted again in November/December 2009 with 22 concerts starting in the UK and ending in Germany. Doug Aldrich will fill in for Craig Goldy on guitar on these dates, who has other obligations. Dio intended to release a new single, entitled "Electra", to coincide with the tour. This would have been their first studio material in 5 years. The band also intended to record an album or two in 2010. 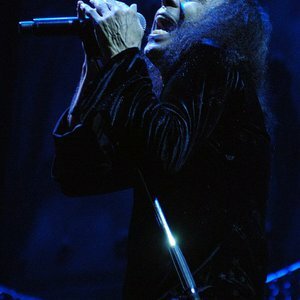 On November 18th the European tour was cancelled due to Ronnie James Dio's hospitalization. He has been diagnosed with stomach cancer, and is now undergoing treatment. His wife and manager Wendy thanked well-wishers and said "After he kills this dragon, Ronnie will be back on stage, where he belongs, doing what he loves best, performing for his fans." In 1999, an animated spoof of Dio appeared in an episode of South Park titled "Hooked on Monkey Phonics". The band appears performing "Holy Diver" at an elementary school dance. Although Ronnie James Dio's appearance is somewhat like himself in reality, the rest of the band just appears as a "stereotypical" heavy metal band with no reference to the real band members. The song "Holy Diver" is on the video games Guitar Hero Encore: Rocks the 80s and Grand Theft Auto: Vice City Stories. Ronnie James Dio died of the aforementioned stomach cancer on Sunday, May 16th, 2010. 2) Diorno ?Dio? Braaf is a dutch hiphop artist rapping in Dutch language. His first major hit was a feature on a track by the opposites named ?Dom, Lomp en Famous,? which also features Willie Wartaal from Dutch hiphop band De Jeugd van Tegenwoordig. His next major hit was ?Stuk? with The Partysquad, his first and only top 10 hit till date. After Stuk he rought out his first album named ?Rock-N-Roll,? which brought him his first major hit as a not featured artist named ?Tijdmachine,? which features rapper sef, and ended number 12 in the Dutch top 40.